South Delta Artists Guild and Gallery 1710 are proud to be hosting this event next Saturday, August 19. It will take place on the lawn in front of and beside the Gallery, with activities such as face painting and decorating hobby horses for children, as well as a few miniature horses that have been rescued and are being housed in East Ladner. Our provincial MLA Ian Paton has donated his services as auctioneer, and artists have donated oveer 100 amazing pieces of art – including stunning paintings in many mediums and sizes, sculptures in clay, soapstone and alabaster, as well as paverpol. There are a large number of paintings of horses – they will amaze you. There will be a live auction starting around 11am – with pre-viewing of the artwork starting at 10:30 am. Raffles will be happening, as there have been many wonderful donations from the community as well, and a silent auction with some beautiful artwork and prints. Food and refreshments will be available for purchase, and there are a few covered areas for the children’s activities. This is a community event so please attend, bid, find a treasure and make a donation to this worthy cause. “What started out as a small idea between four South Delta women, cell phones and social media, has turned into a huge fundraising event to raise funds for the Animal Disaster Fund. 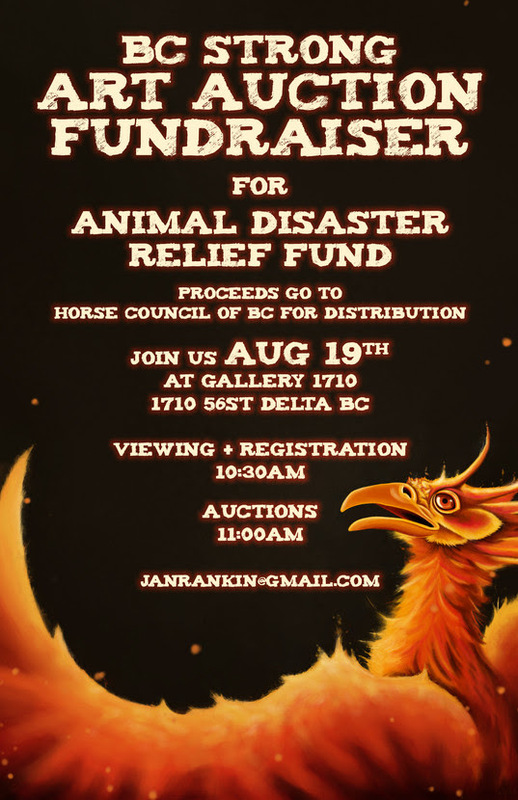 Thanks to local horse enthusiast Jules Davis and Jan Rankin, vice president of the South Delta Artists’Guild, #BCStrongArt4Animals will take place next Saturday, Aug. 19 on the lawn of Gallery 1710 in Tsawwassen. So far more than 100 artists from South Delta, across B.C. – even as far as Ontario -have donated pieces that will be up for auction, which starts at 11 a.m. with live viewing and the auction itself at 11:30 a.m. The event is being billed as family-friendly with face painting, miniature horses who have found shelter at Taisce Stables in East Delta after being evacuated from the Lone Bute area and several raffles as well. Delta South MLA Ian Paton will be on hand as the auctioneer. The West Fine Art Show is a popular event, featuring 17 of Canada’s finest artists at The Glass House Estate Winery in Langley, B.C. A portion of the proceeds will go to benefit the Langley Hospice Society. Beautiful art set in a local winery is a wonderful place to pass the time. Fran Alexander AFCA, Carmel Clare, Catherine Traynor, Joyce Trygg, Judy Vanderveen, Ken Nash, Neil Hamelin SFCA, Rick Pennell, and Grazyna Wolski, AFCA. The Mid Main Art Fair is considered one of Vancouver’s premier artist-run shows – always a must-see on the local visual arts calendar. This event on Sunday, June 11th from 11AM to 6PM at Vancouver’s beautiful Heritage Hall at 3102 Main Street, located amongst the brew pubs, coffee shops and restaurants of Main Street, a wonderful place to spend a Sunday. This year, the popular one day art fair features 18 established artists from the Lower Mainland showing works in a variety of media and styles, including painting, sculpture, photography, and printmaking. The exhibiting artists are Fran Alexander, Mariko Ando, Enda Bardell, Jane Crosby, Lorn Curry, Christine Hood, Jeanette Jarville, Sheree Jones, James Koll, Carol Mcquaid, Sonia Mocnik, Nicola Morgan, Edward Peck, Jackie Conradi Robertson, Elisabeth Sommerville, Camille Sleeman, Jeff Wilson and Grazyna Wolski. Submissions are accepted on an on-going basis. The deadline to propose an exhibition for our 2018 schedule is Tuesday September 19, 2017.
a) Introduce yourself (or group) and include a description of the artwork you want to show. b) We are looking for exhibitions and artwork that will challenge visitors and provoke conversation. In your artist statement, please include what the work is about thematically and why it is important that the public has the opportunity to engage with the exhibition. c) If you require any special equipment, describe your specific needs. d) Outline your ideas for a public program (artist talk, performance, music, dance, etc) that will enhance the understanding of your work. e) Include the earliest date that the exhibition, as described in your proposal, would be ready to show. Work in all media will be considered. 500 words maximum. Curriculum Vitae – Include your address, phone number and email, education, exhibition history, teaching or employment related to your art. Please also include mention of awards and scholarships, bibliography of reviews or articles. 300 words maximum. Artist Statement – Describe the focus of your recent work and your objectives. 500 words maximum. Images (CD only) – Include 10 – 20 images of the work you are proposing to exhibit. If a group proposal, send up to 3 images for each artist. Digital images should be jpg format; each image should be at least 800 x 600 pixels. Must be PC compatible – check CD before submitting. Do not send original works of art or photographic prints. Image List – Include a list of images with corresponding numbers, title of work, medium, dimensions, price (or NFS) and year of completion. (Optional) Self-Addressed Stamped Envelope – Envelope should have adequate postage for return of submission material. Applications with no postage will not be returned. Please do not mark for pickup. No email submissions please. Membership in the Seymour Art Gallery Society is not required in order to make a submission to the gallery. With the exception of our fundraising exhibitions, the Discovery juried exhibition, and Start with Art, artists cannot appear in group exhibitions more frequently than every 3 years. Artists may not have solo exhibitions at Seymour Art Gallery more frequently than every 5 years. Online150 – Do good, get paid for your art. Online150 is an online extension of Timeraiser150. Through Online150 Canadians from coast to coast can trade volunteer hours for an original piece of art or craft. Volunteer hours can be completed with any nonprofit organization in the community. Artists are paid for their work, nonprofits find skilled volunteers, Canadians find meaningful volunteer opportunities. Are you an emerging artist who would like to have your art, prints, and/or artisan crafts (pottery, textiles etc.) to be purchased for Online150? Fill in the form at www.timeraiser.ca/artist to submit your work. If your work is selected, Framework Foundation will send you a contract and payment electronically and your art will be made available on the Online150 platform. STEP 1: Timeraiser fosters the next generation of art patrons and values Canadian artists. Each year, artists from around the country apply to have their work purchased by Timeraiser. All the artwork auctioned by Timeraiser is purchased at fair market value, set by the artist. STEP 2: Connect with local nonprofit organizations looking for talented volunteers. Finding skilled volunteers is a challenge. Timeraiser partners with nonprofits across a wide range of social sectors to offers them a unique way to meet talented new volunteers and to promote their good work to a wider audience of supporters. STEP 3: Bid time. Do good. Get art. Everything comes together at a Timeraiser party and on Online150. Attend a party and kickstart your art collection by bidding volunteer hours on original art by up-and-coming Canadian artists. Winners have one year to finish volunteer hours and claim their piece of art. The best part? Volunteer with any nonprofit(s) you choose! Download the Timeraiser app to keep track of all your volunteer hours and send them directly to Framework. Online150 is an online extension of Timeraiser150. Through Online150 Canadians from coast to coast can purchase art by volunteering their time with a nonprofit organization in their local community. STEP 4: Get involved. Even if you don’t end up winning an original piece of art, join in the social good by pledging hours to volunteer in your community. In 2017, Framework aims to collectively raise more than 150,000 volunteer hours for nonprofits across Canada, connecting Canadians to their communities and the causes they care about.